BYD has recently held a press conference to announce its first 18-meter high floor pure electric bus in Bogota, Colombia. It is said that the launch was in line with BYD’s strategic moves to expand its new energy vehicles globally. BYD actively strives to disseminate its safe and environmentally-friendly products to cater for different markets. Its 18m high-floor articulated pure electric bus was specially designed for Bogota Transmilenio BRT system; it carries 160 passengers in full occupation. 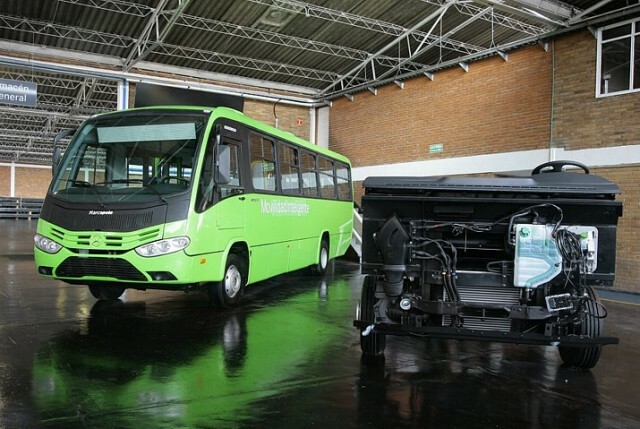 By equipping it with its proprietary core advanced technology, the fire-safe, non-toxic, iron-phosphate battery, combined with in-wheel motor drive and regenerative brakes, BYD’s 18-meter pure electric bus offers the most economical solution, and eliminates the uncomfortable jerks and vibrations of conventional diesel buses. Fred Ni, Vice president of BYD America stated that this bus takes only 2.5 hours to fully charge and features more than 280km driving range on a single charge. 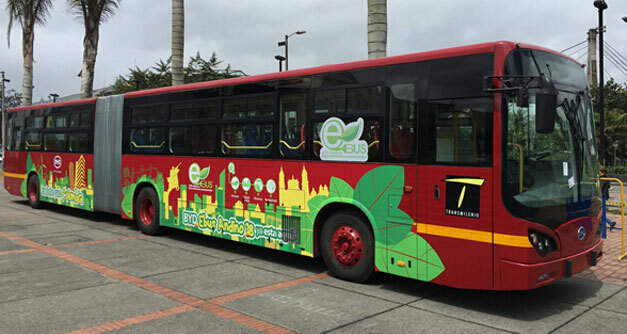 This June, the BYD 18-meter pure electric bus will officially start testing in Bogota. BYD’s global expansion of its pure electric vehicles has been outstanding, reaching over 150 cities in 36 countries worldwide. Gabriel Vallejo López, the Minister of Environment in Colombia spoke highly of BYD pure electric buses. He said that when thinking about how to cope with the greenhouse effect, the first thing to come to mind should be pure electric vehicles. Mahindra launched its all new small commercial vehicle, Jeeto from its Zaheerabad plant in the state of Telangana yesterday. 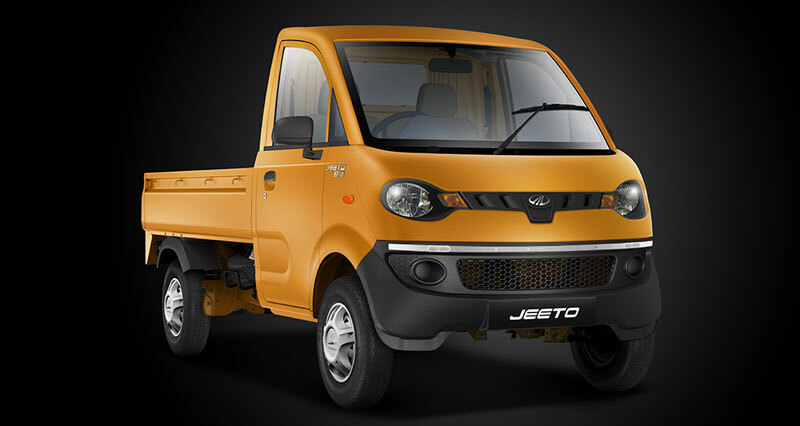 According to Mahindra, the Jeeto is the first ever product in its category with a modular range of 8 mini-trucks to cater to the varied needs of the sub 1 tonne load segment customers, and will be available in S, L & X series, catering to mini-truck, micro-truck and 3 wheelers customers. Under the hood, the Jeeto offers multiple options to choose from – 2 powertrains of 8.2 kW (11 HP) and 11.9 Kw (16 HP), 2 payloads of 600 and 700 kgs and 3 deck lengths of 1630mm (5.5ft), 1780mm (6ft) and 1930 mm (6.5ft).These combinations will be available across a range of 8 mini-trucks, namely S series (S6-11, S6-16), L series (L6-11, L6-16, L7-11, L7-16) and X series (X7-11, X7-16) and will lend the Mahindra Jeeto an unmatched versatility and superior efficiency to haul goods across different segments. Powered by m_Dura, an all-new Direct Injection (DI) diesel engine from the Mahindra stable, Jeeto is designed for refined performance and delivers fuel efficiency of upto 37.6 km/l. Further coupled with lower maintenance cost and the ability to carry varied load options effectively, Jeeto, will deliver upto 30%* higher profit than its nearest competitor. The Jeeto also comes with a warranty of 2 years/40,000km (whichever is earlier). It will be available in 5 attractive colours of Diamond White, Sunrise Red, Mango Yellow, Ultramarine Blue and Premium Biege. Inside, the leather seats also feature the ‘Red Wharf Bay’ graphic and ‘no 2,000,000’ logos have been stitched on the headrests. A bespoke aluminium plaque, signed by everyone who helped to assemble the vehicle is fitted to the driver’s seat plinth. The vehicle will be publicly unveiled by Bonhams at Goodwood Festival of Speed, being held 25-28 June. Daimler is further expanding its bus business in Latin America with a new bus plant in Funza near Bogotá with an installed capacity of 4,000 units per year. “With our modern bus portfolio featuring BlueTec 5 technology, we are meeting the growing demand of the Colombian market and our neigh-bouring Latin American countries for clean and efficient vehicles”, says Mathias Held, President of Daimler Colombia S.A.
With the new bus plant in Funza, Daimler strengthens its production network for commercial vehicles in Latin America which is managed by Mercedes-Benz do Brasil. They include the three production plants in Brazil located in São Bernardo do Campo, Campinas and Juiz de Fora. The integrated production network also comprises the Argentinian plant in Buenos Aires as well as the new Colombian plant in Funza near Bogotá. With a total of five production sites, Daimler is thus the largest manufacturer of commercial vehicles in Latin America. In the difficult market environment of 2014, the Daimler Buses division was able to secure its leading market position in Latin America with a market share of 48.6 percent and sales of 17,600 units. Arriving in time is important in all transport operations, but for time-critical transports it can be a crucial key to retaining a haulage contract. With Volvo Trucks’ new positioning service, Positioning+, it is possible to track the vehicle’s geographic location, minute by minute. It’s a facility that creates the necessary prerequisites for more efficient logistics. “One good example is the concrete industry. Timing is everything – down to the very minute the truck must roll up to take delivery of its load of concrete. When mixing concrete, the mixture is individually adjusted to match the time needed for loading and the time needed for delivery and casting. With Positioning+ it is possible to precisely determine when the truck will arrive and to prepare the concrete blend accordingly,” says Johan Östberg, Product Specialist at Volvo Trucks. Apart from the real-time positioning feature this service makes it possible to define a geographic area, a route or an entire country and receive messages every time a truck passes through these defined areas. This is particularly useful in warehousing operations, where staff need to know when a truck arrives and when it leaves so they can carry out follow-on activities. For certain types of transport the positioning service also offers additional benefits. “If a truck deviates from its route, the system issues an alert. 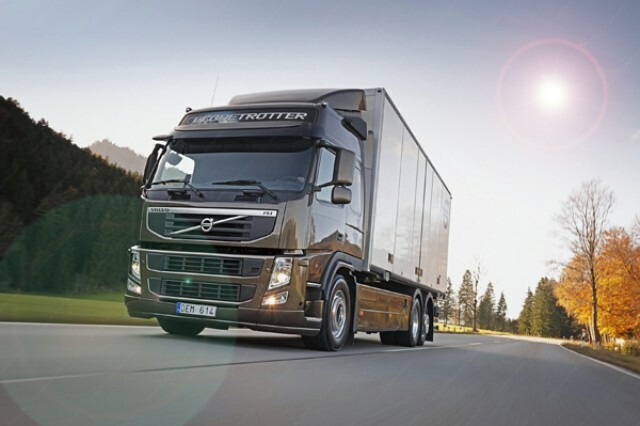 This creates a safer, more secure working environment for drivers hauling high-value goods,” explains Johan Östberg. Positioning+ is a supplement to Dynafleet Positioning – a service within Dynafleet, Volvo Trucks fleet management system. Positioning+ provides information about real-time position by the minute, thus assisting time-critical transports. The service also makes it possible to define a geographic area, a route or an entire country and receive messages every time a truck passes through these defined areas. TU-Automotive, a leading organization focused on the connected vehicle technology segment, recognized Mack’s ongoing commitment to offering state-of-the-art uptime and telematics solutions with the 2015 Commercial Vehicle Maker of the Year Award. Mack received the award for Mack GuardDog Connect, its integrated telematics solution, and Mack Fleet Management Services during the TU-Automotive Detroit Awards ceremony in Novi, Michigan. GuardDog Connect is a proactive diagnostic and repair planning solution that monitors critical fault codes that could potentially shut down a truck or lead to an unplanned visit to the dealer. Available and standard in Mack Granite, Pinnacle, Titan by Mack and TerraPro concrete pumper models, GuardDog Connect now monitors more than 25,000 Mack models and has maximized customer uptime by reducing diagnostic and repair times by 70 percent and 21 percent respectively. Mack Fleet Management Services, also launched in 2014, combines data from the integrated GuardDog Connect telematics hardware with cloud-based intelligence software, initially offered through Telogis, to help fleet owners enhance their operational performance, reduce costs and increase safety. 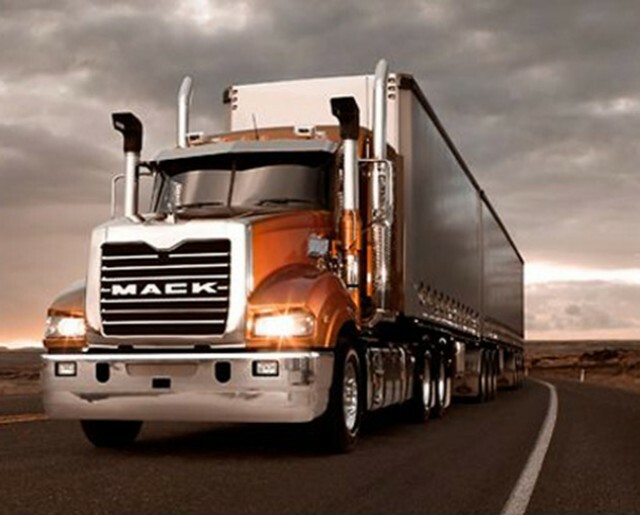 To further support customer uptime, Mack opened its Uptime Center in late 2014. Located near Mack headquarters in Greensboro, North Carolina, this unique facility houses personnel from every customer support function and connects them to Mack customers and dealers through Mack ASIST, a web-based service management system that enables faster repairs by connecting fleet managers and service providers in real time. The TU-Automotive Awards are among the most prestigious awards in the connected vehicle industry, featuring 12 award categories and more than 500 entries from around the world. A panel of six independent judges evaluated all entries before determining a winner for each of the 12 categories. Tata Motors and its Tunisian partner ICAR S.A., the industrial subsidiary of Le Motor South Africa, announced the industrial launch of Tata Motors light commercial vehicle assembly in the presence of her Excellency, the Ambassador of the Republic of India, Ms. Nagma Mohamed Mallick and Mr. RT Wasan, Head – International Business, Commercial Vehicles Business Unit, Tata Motors. Tata Motors will commence production of pickups and light commercial vehicles, with partners ICAR SA, in June 2015. 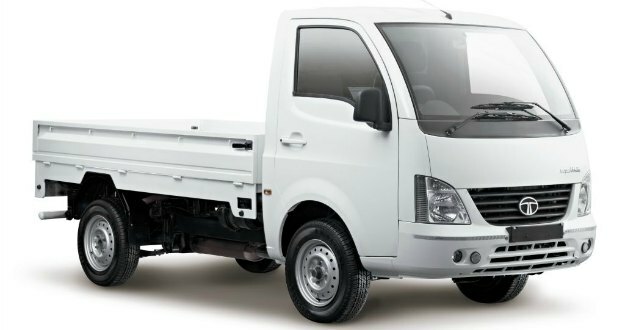 Tata Motors and ICAR SA will start with the production of Tata Xenon pickups and light commercial vehicles Ace and Super Ace. The Tata Xenon will be the most powerful pick-up in the Tunisian market with 140 horsepower and 9 blades leaf spring suspension set-up. The vehicle will also be one of the best equipped, with air conditioning, power steering, alarm, power windows and power mirrors. Tata Motors will offer 3 variants of the pickup: the Single Cab 4X2 and Double Cab in the 4X2 and 4X4 configuration. The Tata Super Ace and Tata Ace will open the door to a new small utility segment in Tunisia, with several application based vehicles for small businesses. 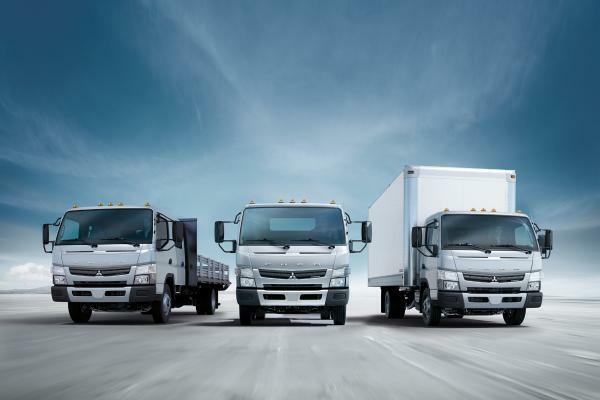 Mitsubishi Fuso Truck and Bus Corporation (MFTBC), one of Asia’s leading commercial vehicle manufacturers, today announced important personnel changes in domestic sales. Mr. Akio Suehiro, currently Senior Vice President and Head of Mitsubishi Fuso Sales Japan, will retire as of June 30, 2015. He joined the company in 1980 and successfully worked in different leadership positions in R&D and Quality Management. In 2011, he took over the position of Senior Vice President and Head of Mitsubishi Fuso Sales Japan. As of June 1, 2015, Mr. Tameo Miwa, former Head of Sales Center Minami-Kanto & Koshin, succeeded Mr. Suehiro as Head of Mitsubishi Fuso Sales Japan. Joining the company in 1986, Mr. Miwa is an expert with a solid background in sales in Japan and has close relationships with our customers. 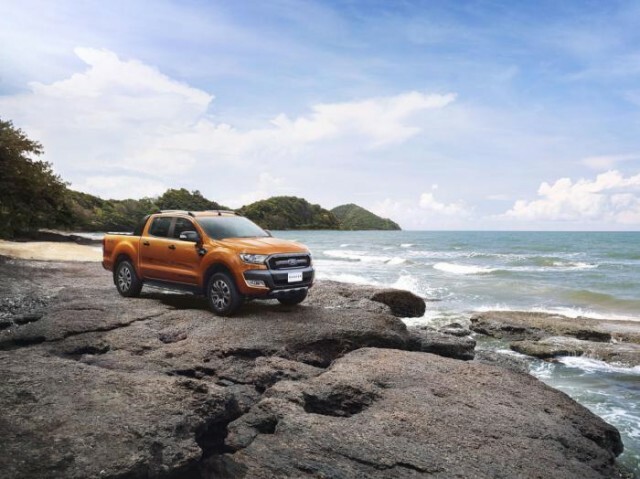 Ford has introduced the new Ranger Wildtrak in Thailand yesterday. In terms of exterior design, the new Wildtrak comes with a “sports hoop,” special graphics and dark liquid metallic gray accents. 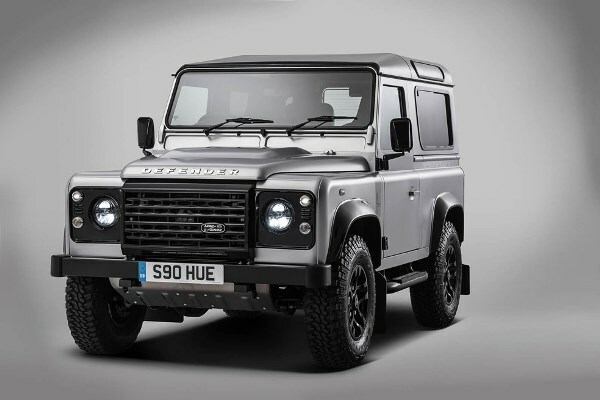 The truck also has fog lights and exclusive 18-inch alloy wheels. It will be available in five colors including Aluminum Metallic, Black Mica, Cool White, Metropolitan Gray and Pride Orange. 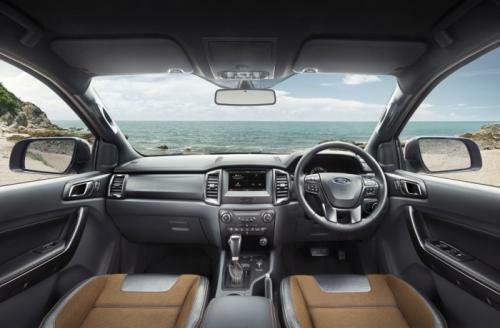 Inside, there is not much difference between the Wildtrak and the standard Ranger, but from what we can see, the former features unique upholstery, shadow chrome air vent surrounds and a soft-touch dashboard with orange accent stitching. The truck also has the SYNC 2 connectivity system as well as an infotainment system with an 8-inch display. Power is provided by a 3.2-liter Duratorq TDCi five-cylinder diesel engine that produces 200 PS and 470 Nm of torque. 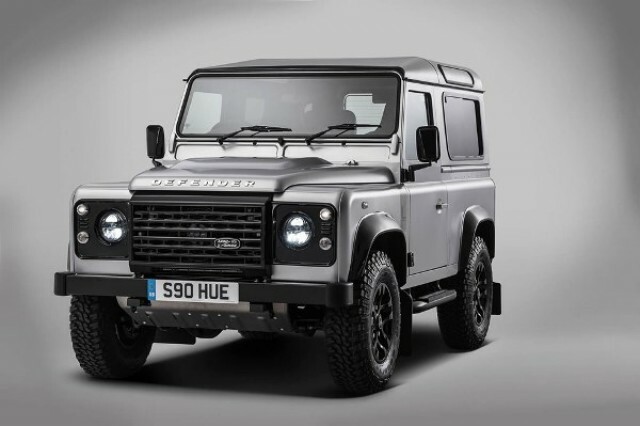 It is connected to a six-speed automatic transmission and a four-wheel drive system with an electronic locking rear differential. Customers can also order a 2.2-liter Duratorq four-cylinder TDCi diesel engine with 160 PS and 385 Nm of torque. Word on the street is that the Wildtrak might arrive on our shores later this year. Italian coach operator “Autolinee Marino” has taken delivery of the 2500th Setra double-decker coach to be manufactured in Neu-Ulm. The S 431 DT is also the 250th vehicle of its type to feature a Euro VI engine. The milestone coach, fitted with 80 “Setra Voyage Plus” seats and two club tables, is part of an order for a total of five S 431 DT models. With the addition of the three-axle vehicle, the Italian operator’s fleet has expanded to include a total of 54 Setra double-deckers. The vehicles are predominantly used for regular service routes between Italy, Luxembourg, Belgium, Switzerland and Germany. Based in Altamura in the province of Bari, the company employs 250 people and has been operating with Setra coaches, including a large number of double-decker models, since 1982. In total the company owns 110 of the Ulm brand’s vehicles. Owner and CEO Gerardo Marino sees plenty of reasons for the German-Italian partnership to continue for many years to come: “With their smooth handling, these coaches offer both passengers and drivers a high degree of comfort. And they’re beautiful to look at”. The S 431 DT, first introduced in 2002, was the flagship of the Setra TopClass 400. This premium model series was superseded in 2014 by the TopClass 500. The 13.89 m-long double-decker coaches, available since 2013 with the Euro VI drive system and the 375 kW (510 hp) OM 471 engine, remain an integral part of the current product range. The Setra TopClass 400 coaches boast over 40 new features not offered by their Euro V predecessors. These include a revised cockpit with a new multifunction steering wheel, two sets of steps as standard and a luggage compartment door that is 23 cm wider. Thanks to its Setra S 431 DT double-decker coach, Daimler is also a compelling choice when it comes to long-distance regular-service transport. With a market share of some 50 percent, Daimler is the leading player in the German long-distance coach market. Demand has led to rapid growth in the double-decker segment in particular. Here the Setra S 431 DT is the dominant force on the road with a share of over 80 percent.